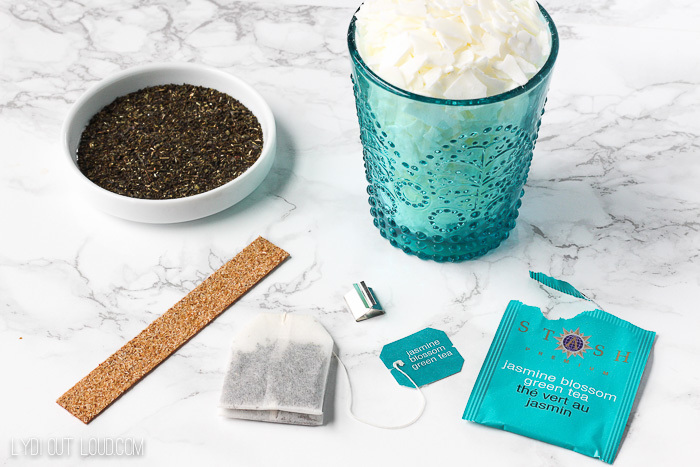 Thank you to Stash Tea for sponsoring this post. I have a sad story (but don’t worry, there’s a happy ending!) Before Ryan and I moved into our house, I had charming vintage (sounds a lot better than old, right? 😉 ) townhouse that had a wood burning fireplace. I absolutely loved it! Even though the fireplace didn’t emit much heat, the sound of the crackling wood made for the feeling of instant coziness! Now we have a gas fireplace (which doesn’t work, long story!) so no crackling wood coziness for us. Wah wah. 🙁 Out of desparation to chase that cozy feeling, I bought a wood wick candle and even though it’s not as loud as actual fire logs, it has helped to fill the void I’ve had for the crackling wood of my wood-burning fireplace. The problem though? Those things are EXPENSIVE! More than I want to pay for a candle considering I burn them pretty much all day, every day. Now for the happy part! I decided to try to make my own wood wick candle. And it was a success! I don’t know why but I’ve always been intimated to try candle making and I was even more intimidated to make a wood wick candle. All of that apprehension for nothing… it was so easy! And as an added bonus that even my fireplace couldn’t deliver, the wood wick candle smells incredible! I came upon the idea for the scent while sipping a cup of Stash Tea (another one of my instant coziness enjoyments). I love inhaling the aroma of the steam from Stash’s teas as much as I enjoy the flavor and warmth of drinking them. My aunt used to make her own tea and I loved the smell when I walked into her kitchen. I get that same effect with my Stash Tea, which is why I thought it would be a perfect way to scent my wood wick candle project. And it was perfect. 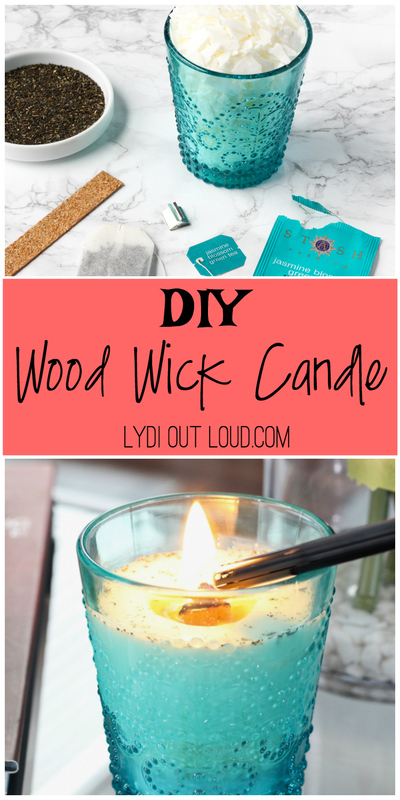 Want to make your own wood wick candle? Don’t be intimated, you will love it! 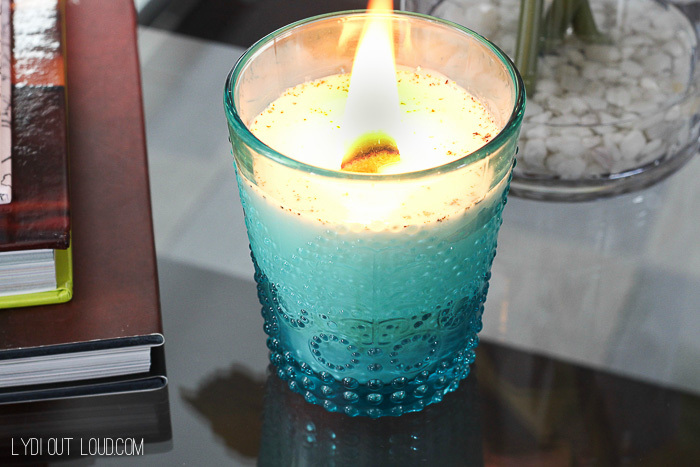 Overfill the candle jar you will be using for your wood wick candle with soy candle wax flakes. Dump flakes in a microwave safe glass bowl. Fill the jar again about ¾ full with soy candle wax flakes and dump into the bowl with the other flakes. Microwave the flakes in 45 second intervals until melted, stirring well between each interval. NOTE: The bowl will be very hot when you remove it from the microwave so you will want to use pot holders. Carefully pour the wax into the candle jar. To prevent the wax from hardening and messing up your bowl, rinse immediately. Cut open 3 bags of Stash Jasmine Blossom Green Tea and pour the contents into a ramekin. Allow the wax to set for about 5 – 7 minutes and begin to sprinkle a little bit of the tea into the candle. If the tea immediately drops to the bottom, wait a few more minutes. 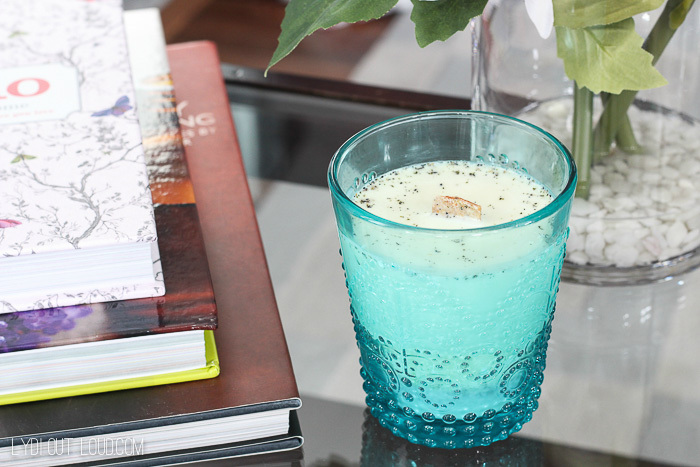 Once you sprinkle in the tea and it slowly drops but is suspended throughout the candle, then you can gradually sprinkle the remainder of the tea into the candle. If necessary, trim the wick to about ¼” above the candle. Sorry for your gas fireplace. Congrats on your success of making wood wick candle. I am also a great fan of wood stove fireplace. You are right are sound of burning wood is special. You won’t find the cozy feel using electric or gas fireplace. Oh no! I have heard some people say they got bad wicks. Are you able to return them? I finally made it to your blog! We sat next to each other on the plane- both on our way to conventions.. 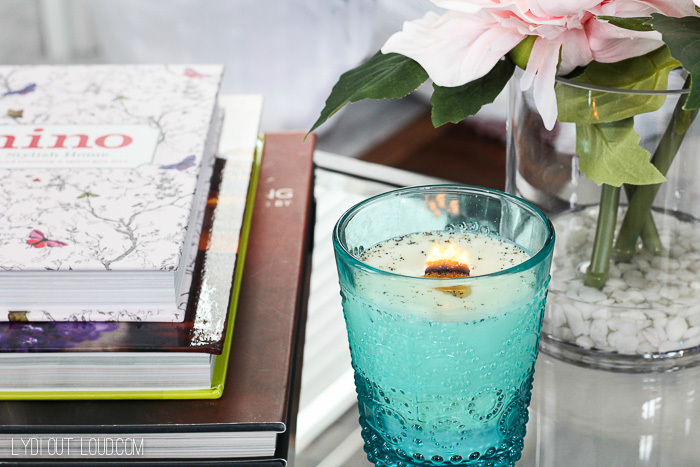 I love this candle idea- cannot wait to make it! I’m looking at the different Stash Teas- some sound super yummy for Christmas…and WOW! What a head start that would be. These candles look great Lydi! I love that you added the loose jasmine tea to the wax, it’s a great finishing touch. Thanks for sharing these with us 🙂 Have a great day! Lydia, this is a great idea and makes me wonder what other great things I can use to scent the candles besides essential oils. 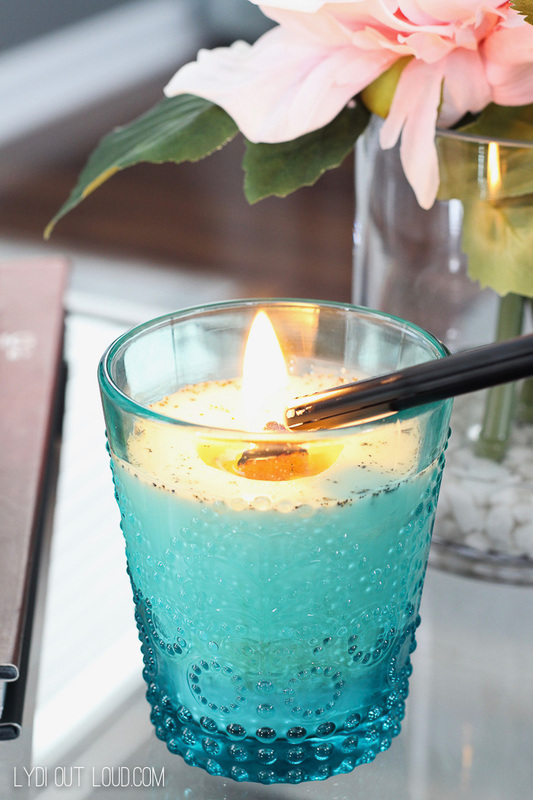 I’ve never added tea to my candles before… what a brilliant idea! This is great, Lydia. I’m going to try something similar. Thanks so much Oliver! I’m so excited that the idea inspired you! I’d love to hear about it and see it when you’re done! What a fun idea! I’ve been wanting to try candle making for a while. Maybe I should give it a go with some wood wicks? You absolutely should Leslie! You’ll be amazed how easy it is and wish that you had done it sooner. I would never have thought of using tea to scent a candle. Great idea I love the smell of stash tees. Wonderful! I wish I thought if this when winter began! Still plenty of time to make a few for each room in the house! Absolutely Simona! Thanks for stopping by! Sounds wonderful and calming. I plan to make several at a time. Great idea! It was the perfect day for your craft. Hi! Where did you get that beautiful teal glass candle jar? Thanks! Hi Johnna! It was a Target Dollar Spot find a couple of years ago, I still see similar ones pop up there every so often!